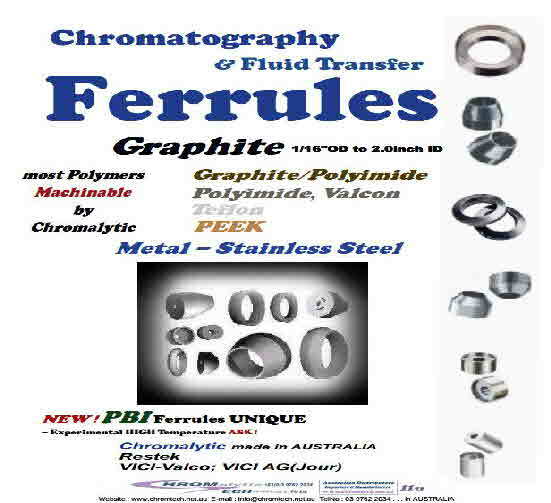 Ferrules as used in the Chromtechs’ context . 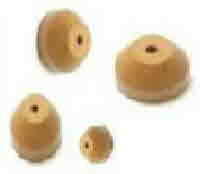 . .
Are leak-tight Pipe-fitting seals connecting Tube Fittings and various type of Tubing; SS, polymeric, glass ceramic , fused silica . 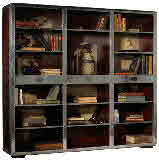 . . in capillary and larger sizes; the latter being “fragile” and will just not sustain compression by metal ferrules. Metal Once-off use - then you’re /they’re “buggared” ! 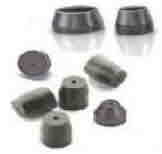 Graphite Ferrules “slide-off” can be re-used many times but do tend to be “captured’ in the Nut if over-tightened. Applications include chromatography connections where gas-tight seals are essential both in positive pressure but also under high Vacuum such as GC/MS where the material used must be high purity and sustainable at up to 450degC nowadays. Common sizes range from (1/32, 1/16, 1/8, 1/4”OD with IDs tube size as small as 0.3mm up to 2.0”ID and larger for more exotic applications ? ASK! AS far as we know we are the ONLY OEM of GFS with IDs larger than 1/2” . . . ANYWHERE ! & where the Metal Ferrules are just NOT Good Enough ! 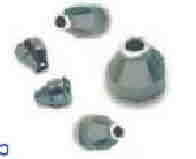 They are soft and malleable and deform to fit the shape of the fittings “internals” . . . and help to reduce dead-volume. DONT USE with Hydrogen/Oxygen Air/ at High Temp >300c ? & the original “Big Deal” ! polyimide > various “subtle” thermal expansion effects ! & generally TOO Hard x for Glass / Ceramic tube useage !